NAWCC Chapter 190 is holding its annual Seaside Clock and Watch Mart on Sunday, September 15, 2019. It will be a great event with hundreds of Clocks, Watches and Tools for sale. Admission to the Mart is $10 on the day of the event. For the shoppers in the family, the Ventura Fairgrounds is a short distance from the Camarillo Premium Outlets. Click here for more information. 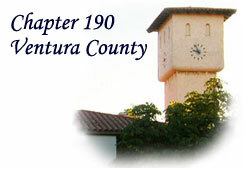 Click here for information on visiting Old Downtown Ventura. As you can see this will be a great weekend in the Ventura County Area! Use PayPal or a credit card to purchase your Mart admission and/or tables. Just click the appropriate 'add to cart' button(s) below. When you are finished selecting items, click the 'View cart' button to check out.